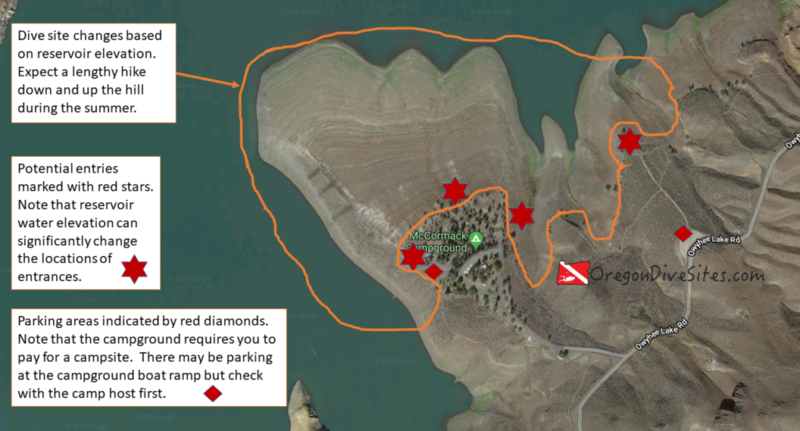 The McCormack Campground at Lake Owyhee is a good place to base for a few days of diving in this southeast Oregon high desert reservoir. This dive site doesn’t have that interesting of topography but it still is worth a look. You can launch a boat from here to explore the further reaches of the canyon as well. McCormack Campground is a good place to base out of for a few days of diving in Lake Owyhee. Before parking here, check with the camp host to see where they want you to park. They may have you park out by the main road if the campground is full. The campground is on a peninsula that is surrounded on three sides by the lake. The steep submerged cliffs can be interesting to dive although there isn’t that much interesting topography close to shore. The entrances/exits are simple walk-ins although they may be muddy and slippery near the water’s edge. There may be a few waves from passing boats. Occasionally there can be some current when the dam is spilling a lot of water. In the late summer, visibility can be 3 inches due to algae blooms and stagnant water. In the late winter and spring when water flows are high, viz can be up to 30 feet. Depending on the time of year and how bad drought conditions are, temperatures might be in the mid 30s or the mid 60s. Spring has the best opportunity for good visibility. You might be able to find 100 feet of water when the reservoir is completely full. This is an altitude dive site and requires the training to make sure you are within recreational scuba limits. We rate this an intermediate dive site because of the altitude. Depending on where you park and how high the reservoir is, McCormack Campground might be only a few feet from the water or you might have to hike more than 1000 feet to reach the water’s edge. No surface swim is necessary. The campground at McCormack Campground is a good choice. There are a couple other campgrounds in the immediate area as well.